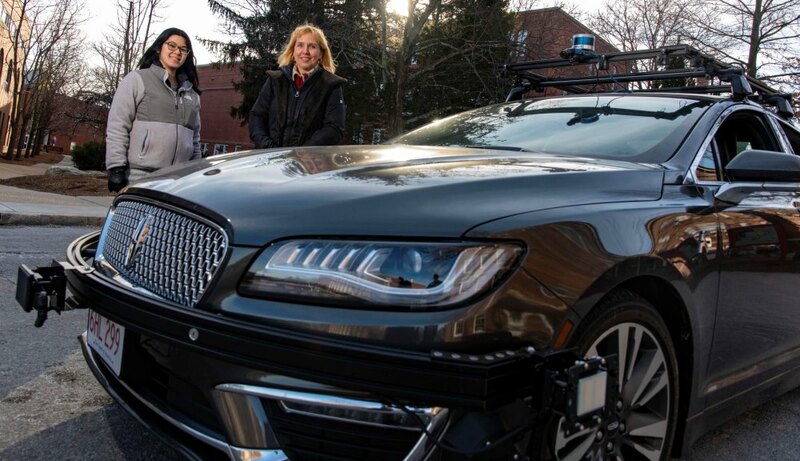 Elke Rundensteiner, right, and PhD student Allison Rozet with an autonomous vehicle testbed used in research at WPI. The analytics tools they are developing could make driverless cars safer by analyzing data streaming from vehicles in real time. With support from the National Science Foundation, a team at Worcester Polytechnic Institute is developing software to help organizations in a range of fields, including transportation and health care, make data-driven decisions in real time. Elke Rundensteiner’s research focuses on methods for gleaning actionable insights from very large volumes of information, whether that is data streaming over networks or information stored in databases. One recent project involved developing big data tools to seek potentially life-saving patterns in reports on incidents involving drugs and medical devices. Event processing is a way to track and analyze incoming streams of information, such as online purchases, the rise and fall of a stock price, the length of time users remain on a website, or whether healthcare workers wash their hands before entering patients’ rooms. It’s all about flagging important events in the incoming data, so an organization can respond to them in real time. SETA will be able to handle complex queries and analytics, while providing users summarized insights cheaper and faster than is currently possible. Most existing data analysis tools are not designed to work with streaming data, Rundensteiner noted. Instead, information must be stored in a static database before it can be analyzed, introducing a delay that might prevent the fast detection, for example, of the start of an infectious disease outbreak in a hospital. Rundensteiner’s tools operate on the data as it is being generated, allowing even complex patterns to be spotted in real time, so critical decisions can be made quickly. With the new award, Rundensteiner will build upon her previous NSF-sponsored research in event stream analytics, which focused on finding patterns in streaming data. That work (in collaboration with former PhD students, Olga Poppe, a research scientist at Microsoft Gray Systems Lab, Chuan Lei, a research staff member at IBM Almaden Research Center, and Di Wang, a research scientist at Facebook), produced analytics tools that enabled users to query a data stream for relatively simple event sequences. But if the software found many instances of the same or similar sequences and displayed them all, the user would often become overwhelmed and miss the significant patterns or the overall trends across patterns. To create new event trends analytics tools, Rundensteiner must first design a new query language, which is used to find and retrieve patterns in the data. By allowing users to search for more complicated patterns, the new language will make the tool significantly easier to use. She is also building a new “query engine” to process these sophisticated queries and find the requested patterns or events. A distributed engine, it will run on multiple servers across a cloud network, dramatically increasing its speed. The new event trends analytics software, which she is developing with Allison Rozet, a PhD candidate in data science, will be tested using real-world datasets and applications supplied by a health care center and a financial transaction processing company.